Msgr. John Kozar, President of CNEWA, enjoys a laugh with Cardinal Sean P. O’Malley,O.F.M. Cap. Boston’s Archbishop, Cardinal Sean O’Malley, O.F.M. Cap., paid a visit to our New York offices this morning. Cardinal Sean is also a member of the CNEWA board, and was curious to meet some of the staff and see what we do. CNEWA President Msgr. John Kozar gave him a tour of our offices, introduced him to the staff, and clearly had a great time. An Ethiopian monk prays at the Church of the Holy Sepulchre in Jerusalem’s Old City. The crisis jeopardizes the region’s Christian communities in ways that go beyond economics. According to Christian leaders in the area, the absence of Christian pilgrims in the birthplace of their faith is having a troubling impact on local parishioners and even the hope for peace in the Middle East. For more, check out Holy Land: increase in number of Christians returning home. Bishop Joseph Kunnath from Adilabad, India, dropped by the offices of CNEWA in New York Thursday afternoon. He was returning from a mission appeal to Lansing, Michigan, and stopped by to meet Msgr. John Kozar, CNEWAs new president, and M.L. Thomas, the regional director for India. Bishop Joseph was eager to share news of some remarkable developments in his homeland: the 15,000 new Catholics who live in his diocese, he said, have all made a commitment to become evangelists. “They will come with us to each new village,” he said, explaining that they will be venturing into a region of southern India that is not Christian. He explained: “They see us praying and they want to join us.” Bishop Joseph added that the people dont ask for anything except faith. Turkey’s diversity has been well documented in the pages of ONE — including members of the Roma community, seen in the photo above partaking in an ancient celebration marking the arrival of spring. The celebration includes bonfires, traditional music and dancing. Though the Roma are a minority, their culture and traditions remain strong. 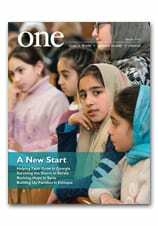 For more about Turkey’s diversity check out, Turkey’s Melting Pot from the May 2011 issue of ONE. Turkey was in the news this week, being touted as an example of progress in the disarray within the Middle East. “Turkey is the only country that has a sense of where things are going, and it has the wind blowing on its sails,” said Soli Ozel, a professor of international relations at Istanbul Bilgi University. The country’s foreign policy seized the attention of many in the Middle East and beyond after Prime Minister Recep Tayyip Erdogan’s tour this month of three Arab countries that have witnessed revolutions: Tunisia, Egypt and Libya. Even Mr. Erdogan’s critics were impressed with the symbolism of the trip. For more, read the New York Times article, In Riddle of Mideast Upheaval, Turkey Offers Itself as an Answer. In the May 2010 issue of ONE, journalist Liam Stack shared the stories of the sisters and children at the Santa Lucia Home for the Blind — which was built with funds from CNEWA donors. Santa Lucia inspires dedication and devotion among its faculty and staff. Samira Ibrahim Matta was one of the first teachers hired by Father Tarcisio. Every afternoon, she teaches the intricacies of Arabic grammar, a language whose swooping letters they learn to write on small, clanging Braille typewriters. Between school and afternoon classes at the home, residents learn to read and write Braille in Arabic, English and French. Proud of her role at Santa Lucia, Ms. Samira teaches her students not only reading and writing, but lessons about life. A few years ago, her own vision began to fade, and today she is blind. As hard as it has been for her to adjust to being blind, she uses her own, recent experiences as a way to teach the children to respect themselves and work hard. “I don’t want to congratulate myself for what I do, it is just important to teach them to challenge themselves and the difficulties of their lives,” Ms. Samira explains. Learn more about the Santa Lucia Home in Blind to Limitations by Liam Stack. I am truly glad to be taking part in this meeting with you here in Berlin. I warmly thank President Dr. Dieter Graumann for his kind and thoughtful words. They make it very clear to me how much trust has grown between the Jewish people and the Catholic Church, who hold in common a not insignificant part of their essential traditions, as you emphasized. At the same time it is clear to us all that a loving relationship of mutual understanding between Israel and the Church, each respecting the essence of the other, still has further to grow and needs to be built into the heart of our proclamation of the faith. In this place, remembrance must also be made of the Kristallnacht that took place from 9 to 10 November 1938. Only a few could see the full extent of this act of contempt for humanity, like the Berlin Cathedral Provost, Bernhard Lichtenberg, who cried out from the pulpit of Saint Hedwig’s Cathedral: “Outside, the Temple is burning — that too is the house of God”. The Nazi reign of terror was based on a racist myth, part of which was the rejection of the God of Abraham, Isaac and Jacob, the God of Jesus Christ and of all who believe in him. The supposedly “almighty” Adolf Hitler was a pagan idol, who wanted to take the place of the biblical God, the Creator and Father of all men. Refusal to heed this one God always makes people heedless of human dignity as well. What man is capable of when he rejects God, and what the face of a people can look like when it denies this God, the terrible images from the concentration camps at the end of the war showed. I would also like to express my gratitude for the deepening dialogue between the Catholic Church and Judaism. The Church feels a great closeness to the Jewish people. With the Declaration Nostra Aetate of the Second Vatican Council, an “irrevocable commitment to pursue the path of dialogue, fraternity and friendship” was made (cf. Address in the Synagogue in Rome, 17 January 2010). This is true of the Catholic Church as a whole, in which Blessed John Paul II committed himself to this new path with particular zeal. Naturally it is also true of the Catholic Church in Germany, which is conscious of its particular responsibility in this regard. In the public domain, special mention should be made of the “Week of Fraternity”, organized each year during the first week of March by local Societies for Christian-Jewish Partnership. On the Catholic side there are also annual meetings between bishops and rabbis as well as structured conversations with the Central Council of Jews. Back in the 1970s, the Central Committee of German Catholics (ZdK) took the initiative of establishing a “Jews and Christians” forum, which over the years has issued many well-written and helpful documents. Nor should I omit to mention the historic meeting for Jewish-Christian dialogue that took place in March 2006 with the participation of Cardinal Walter Kasper. That cooperation is proving fruitful. The message of hope contained in the books of the Hebrew Bible and the Christian Old Testament has been appropriated and continued in different ways by Jews and Christians. “After centuries of antagonism, we now see it as our task to bring these two ways of rereading the biblical texts — the Christian way and the Jewish way — into dialogue with one another, if we are to understand God’s will and his word aright” (Jesus of Nazareth. Part Two: From the Entrance into Jerusalem to the Resurrection, pp. 33f.). This dialogue should serve to strengthen our common hope in God in the midst of an increasingly secularized society. Without this hope, society loses its humanity. All in all, we may conclude that the exchanges between the Catholic Church and Judaism in Germany have already borne promising fruits. Enduring relations of trust have been forged. Jews and Christians certainly have a shared responsibility for the development of society, which always includes a religious dimension. May all those taking part in this journey move forward together. To this end, may the One and Almighty, Ha Kadosch Baruch Hu, grant his blessing. I thank you. Visit this link for more on the pope’s remarks to Jewish leaders in Germany. I am glad to be able to welcome you here, as the representatives of different Muslim communities in Germany. From my heart I thank Professor Mouhanad Khorchide for his kind greeting. His words show me what a climate of respect and trust has grown up between the Catholic Church and the Muslim communities in Germany. Berlin is a good place for a meeting like this, not only because the oldest mosque on German territory is located here, but also because Berlin has the largest Muslim population of all the cities in Germany. From the 1970s onwards, the presence of numerous Muslim families has increasingly become a distinguishing mark of this country. Constant effort is needed in order to foster better mutual acquaintance and understanding. Not only is this important for peaceful coexistence, but also for the contribution that each can make towards building up the common good in this society. Many Muslims attribute great importance to the religious dimension of life. At times this is thought provocative in a society that tends to marginalize religion or at most to assign it a place among the individual’s personal choices. The Catholic Church firmly advocates that due recognition be given to the public dimension of religious adherence. In an overwhelmingly pluralist society, this demand is not unimportant. Care must be taken to guarantee that others are always treated with respect. Mutual respect grows only on the basis of agreement on certain inalienable values that are proper to human nature, in particular the inviolable dignity of every single person. Such agreement does not limit the expression of individual religions; on the contrary, it allows each person to bear witness explicitly to what he believes, not avoiding comparison with others. In Germany — as in many other countries, not only Western ones — this common frame of reference is articulated by the Constitution, whose juridical content is binding on every citizen, whether he belong to a faith community or not. Naturally, discussion over the best formulation of principles like freedom of public worship is vast and open-ended, yet it is significant that the Basic Law expresses them in a way that is still valid today at a distance of over sixty years (cf. Art. 4:2). In this law we find above all the common ethos that lies at the heart of human coexistence and that also in a certain way pervades the apparently formal rules of operation of the institutions of democratic life. We could ask ourselves how such a text — drawn up in a radically different historical epoch, that is to say in an almost uniformly Christian cultural situation — is also suited to present-day Germany, situated as it is within a globalized world and marked as it is by a remarkable degree of pluralism in the area of religious belief. The reason for this seems to me to lie in the fact that the fathers of the Basic Law at that important moment were fully conscious of the need to find particularly solid ground with which all citizens would be able to identify. In seeking this, they did not prescind from their own religious beliefs; indeed for many of them, the real source of inspiration was the Christian vision of man. But they knew they had to engage with the followers of other religions and none: common ground was found in the recognition of some inalienable rights that are proper to human nature and precede every positive formulation. In this way, an essentially homogeneous society laid the foundations that we today consider valid for a markedly pluralistic world, foundations that actually point out the evident limits of pluralism: it is inconceivable, in fact, that a society could survive in the long term without consensus on fundamental ethical values. This is another reason why I think it important to hold a day of reflection, dialogue and prayer for peace and justice in the world, as we plan to do on 27 October next, twenty-five years after the historic meeting in Assisi led by my predecessor, Blessed Pope John Paul II. Through this gathering, we wish to express, with simplicity, that we believers have a special contribution to make towards building a better world, while acknowledging that if our actions are to be effective, we need to grow in dialogue and mutual esteem. With these sentiments I renew my sincere greetings and I thank you for this meeting, which has greatly enriched my visit to my homeland. Thank you for your attention! You can read more about his visit at the Vatican News website. Roman’s Girls, a Catholic initiative in Addis Ababa, assists about 20 girls with school. Today marks the autumnal equinox in the northern hemisphere — the first day of fall. For more, check out the May 2009 issue of ONE. Also, if you are interested in learning how you can help children in Ethiopia attend school, visit our website for more information.